On February 15th, well-known comedian1 pretending to be an op-ed columnist for The New York Times David Brooks wrote an article about adaptable humans. He chose to use the word Amphibians. This word usage prompted Deadspin’s Albert Burneko to also use the word, attempting to correct Brooks. I will attempt to correct Burneko. In his essay he always capitalizes the word; he is using the word as a cross-demographic term to indicate people who are capable of having several identities during their life. Since I don’t think Brooks has ever pretended to be a biologist in general or a batrachologist in particular, I don’t see anything very wrong with his usage of the word. He’s basically using an informal definition of the word to create an analogy: he’s saying that amphibians live in water and then they live on land, and Amphibians do something similar. He’s appealing to a general audience which includes people who know a lot about zoology and people who know very little, and I will go out on a limb here and assume that he’s also someone who knows very little about zoology. Burneko, on the other hands, wants to talk about actual amphibians. He filed his article to TAXONOMY and ANIMALS, which to me signals that he is trying to discuss facts. Since he wants to discuss facts, I’ll put on my fact-checking hat. Amphibians, as every little kid knows, are born in water, as larvae, breathing water through gills. Later they undergo metamorphosis, and emerge from the water with (in most cases) air-breathing respiratory systems. This seems like a strong way to start this essay because it makes an appeal to popular knowledge. But. This popular knowledge is too general to be true. Not all amphibians are born in water and not all undergo metamorphosis, and since this essay wants to be factual, being inaccurate is not a good start. This wording doesn’t make evolutionary or scientific sense. Organisms do not “fail to evolve” features that other organisms possess, unless we are talking about evolution as some metaphysical activity wherein organisms are striving to become “better”. Amniotes (the tetrapod vertebrates which are alive today as reptiles (including birds) and mammals) evolved a feature, and amphibians are tetrapod vertebrates which evolved different (not necessarily “better” or “worse”) features. amphibians are uncommonly specialized and vulnerable creatures. This wording doesn’t make evolutionary sense either. Amniotes all have a less permeable skin than amphibians, which has costs and benefits. A benefit is that we amniotes can live in less humid environments, which includes (this comes up again later) marine environments. A cost is that we need to breathe air more than amphibians do. There is at least one species of frog that can remain buried in mud for, in some cases, years. There’s at least one amniote (this turtle) which can avoid breathing air for days, but in general amniotes can’t go long periods of time without breathing. This wording doesn’t make taxonomic sense, because it’s claiming that amphibians are defined by features they lack, which is not how taxonomists of the past few decades have been taught to define groups. We instead learn to define groups by features they possess. , and this is why there are not a lot of salamanders chilling out in the Alps. This phrase is extremely confusing to me because salamanders do “chill out in the Alps” and I can’t tell if the author was trying to make a joke or was unaware. 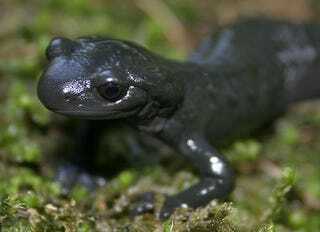 Salamandra atra, the alpine salamander, is a salamander that gives live birth to young which live inside their mother for a while; they get pregnant. It lives at altitudes of up to 2800 meters (~9186 ft) above sea level. Amphibia, a class of evolutionary relics uniquely unprepared to withstand a changing environment, will not do. I’m not sure why the author is italicizing Amphibia. Nor why he is referring to amphibians as evolutionary relics, since that terminology makes no sense. Nor why he thinks amphibians are bad at withstanding changing environments if modern groups of amphibians have been around at least since the Triassic and maybe going back into the Permian. People might not like being classified as arthropods—who wants to be a cockroach?—but how about mammalia? I’m not sure why the author chose to italicize but not capitalize Mammalia. With their self-regulating body temperatures, their ability to incubate their offspring inside themselves, and the warm fur that covers at least part of their bodies,. Firstly, monotreme mammals do not do the middle of those things, so hashtag not all mammals. Secondly, the only thing unique about therian mammals is that we do all three at the same time. Birds have self-regulating body temperatures and feathers basically work as well as fur to provide warmth. Some amphibians incubate their offspring inside themselves, ditto reptiles. There are mammals everywhere! There are mammals in the frosty Himalayas: The snow leopard sometimes hunts for food as high as 18,000 feet of altitude, miles higher than any reptile could ever survive. There are mammals at the bottom of the ocean: The mighty sperm whale can stay submerged for up to 90 minutes—longer than some amphibians! Burneko gets a point here because amphibians are terrible at surviving in marine environments. But as already mentioned, amphibians can hold their breath much much longer than mammals. The Saharan Desert isn’t the driest desert so I don’t know why Dromedary camels were brought up. The Atacama Desert is the driest hot desert and its vertebrate fauna includes mammals … and amphibians. Just ignore the amphibians, they’re not supposed to be there. There are mammals in Siberia, reindeer just walking around reasonably comfy in their thick fur in minus 90 degrees Fahrenheit like it is not even all that big a deal. Do you know what they call a frog in minus 90 degrees Fahrenheit? They call it ice. For everyone living outside of the US, -90°F is ~-68°C. Amphibians do indeed not like those temperatures, and they become very inactive during those temperatures. So inactive that their hearts stop. But then when it warms up, their hearts start back up again. In summary, amphibians can survive events which would kill mammals, and vice versa. And if you’re trying to argue that amphibians are bad at life whereas mammals are amazing, you should use facts which support your position instead of misinterpretations. Since the Gizmodo Media Group blogs include people who read Wikipedia for fun have learned about biological organisms, at least one commenter wanted to tell Burneko that his article had errors. But it seems like the first attempt was dismissed, and that commenter had to write a second comment. Maybe authors shouldn’t dismiss comments that are critical of non-factual content. 1 This article from March 2003 wherein he argued that the US should “disarm [Iraq] forcibly” has to be a comedy routine, because if it’s meant to be serious than that article would mean he wanted the US to militarily invade another country for imaginary reasons. And that’d be silly, so it must have been a joke article.